Chiddock Flirty Time, 5yo, petite 14hh pony suitable for a small adult or talented youngster wanting a serious competition prospect. 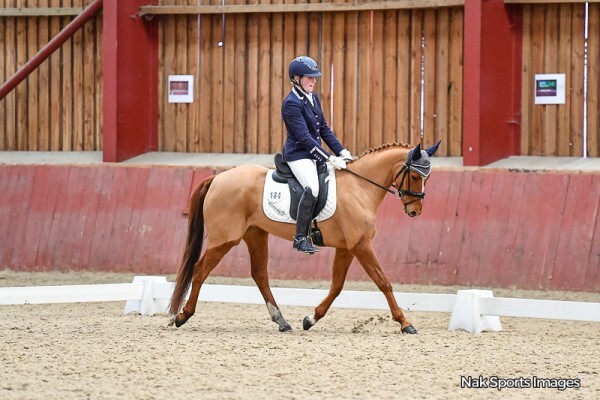 Bred as a show pony out of Chiddock Time Limit, Flo has been professionally broken and began competing BD in July 2018 and has already been placed 5th at her first Regional Championship in the FSM Novice Gold class. Video footage and test sheets of the Regionals and her other tests are available to view. Now ready to take to the Young Pony Qualifiers and is entered into her first Elementary shortly. A stunning pony with bags of potential and a kind nature. Flo has great potential with a good active walk, rhythmical trot and a comfortable, easy canter. An attractive and straightforward mare, she has excellent temperament, great trainability and is fit, sound, always ready to work and very easy to manage. Snaffle mouthed at all times. Never fizzy she can be ridden after several days off with no fuss. Hacks in company or alone, not silly in open spaces, will go first or last. An angel to compete, loads easily, travels well alone or in company, stands quietly on the lorry by herself and is not arena spooky. No vices and a clean veterinary record. Only has front shoes on and is good to shoe. Up to date with worming, vaccination, back, teeth and saddle. Never sick or sorry, happy to live out or in. Good to catch, clip, bath, plait etc.